Victoria is a district in the City of Westminster in central London, named after the major transport hub which covers large part of the district, Victoria Station, which is named after the nearby Victoria Street, in turn named after Queen Victoria. The name is used to describe streets adjoining or nearly adjoining, including Victoria Street, Buckingham Palace Road, Wilton Road, Grosvenor Gardens, and Vauxhall Bridge Road. Victoria consists predominantly of commercial property and private and social housing, with retail uses along the main streets. 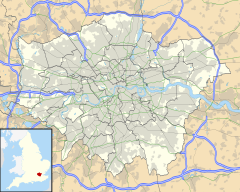 The area contains one of the busiest transport interchanges in London and the United Kingdom, including the listed railway station and the underground station, as well as Terminus Place, which is a major hub for bus and taxi services. 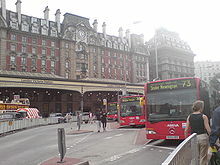 Victoria Coach Station, 900 yards (800 metres) southwest of the railway station, provides road-coach services to long-distance UK and continental destinations. 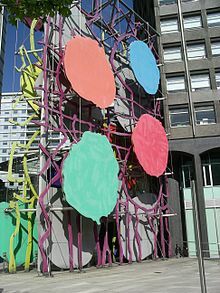 Victoria Street runs on an east–west axis from Victoria station to Broad Sanctuary at Westminster Abbey. Cardinal Place, across the street from Westminster Cathedral, opened in 2006 and contains a selection of restaurants, banks and shops, including a Marks and Spencer store. Further along the street, there is a large House of Fraser department store (formerly the Army & Navy) opposite Westminster City Hall. At the Broad Sanctuary end is the Department for Business, Energy and Industrial Strategy building, the headquarters of Transport for London at Windsor House, and the former New Scotland Yard building (headquarters of the Metropolitan Police Service from 1967 to 2016). For a history of street name etymologies in the area, see Street names of Pimlico and Victoria. 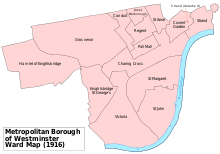 A map showing the Victoria ward of Westminster Metropolitan Borough as it appeared in 1916. The area formed part of the parish of St George Hanover Square. Part of a slum, dubbed "Devil's Acre" by Charles Dickens, was demolished to construct Victoria Street, which opened for use in 1851. Victoria Station was built in 1860. Archibald Leitch who was renowned for his work designing football stadiums including Goodison Park, Craven Cottage, Anfield, Stamford Bridge, Old Trafford, Ibrox and White Hart Lane among many others, had offices were based at 53 Victoria Street (they too are long gone), and the street as a whole housed many consulting engineering firms until the 1970s. According to his biography Norman Wisdom slept near the statue of Marshal Foch by the bus station at the westerly end of the street when his parents split up at the age of 9. Before going into comedy he worked as an errand boy in the then grand Artillery Mansions on Victoria Street which was then a grand hotel. In the 1980s it went into decay and became a squat - and in the 1990s was gutted, refurbished and now it is an elegant apartment block. 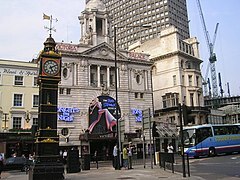 Victoria Palace Theatre has been in its present site since 1832. It was originally known as Moys Music Hall but after Victoria station was built it got demolished. It was demolished again in 1911 due to modernisation. It was most famous for a gold statue of Anna Pavlova which was above it. In 1939 this was removed and lost; a replica has recently been added. It is also known as the home of the Crazy Gang and the Black and White Minstrels. It has hosted countless famous in the yearly Royal Variety Show. Most of the year it hosts musicals (its longest showing was Barnum) its latest being Hamilton. Little Ben, a small 20 ft version of Big Ben, stands in a traffic roundabout outside the Victoria Palace was first erected in 1891 removed in 1963 and put back in 1981. It was erected with sponsorship from Elf Aquitaine Ltd as a gift of Anglo-French friendship. The Apollo Victoria on Wilton Road was designed as a super cinema in the art deco style in the 1930 and opened as the "New Victoria". The cinema closed in 1975 and went through a number of incarnations. In 1981 it opened with a concert by Shirley Bassey. After that it hosted a few musicals until 1984 when the roller musical Starlight Express became the main event for 16 years. They then continued with other musicals including Bombay Dreams and Saturday Night Fever. Its latest attraction is the musical Wicked. Victoria Picture Palace, which opened in 1911, was situated directly across the street from what is now Victoria St Tube Station entrance. In 1978 it reopened as The Venue nightclub (owned by Virgin Records). Musical acts from all over the world performed there including Todd Rundgren, James Brown, The Cars, Captain Beefheart, Hall & Oates, Rocket 88 featuring Alexis Corner, Nine Below Zero & The Skids. 'The Venue', closed its doors in late 1981 and the Auditorium was demolished to make way for an office block. The Foyer section still stands as an Italian restaurant. The House of Fraser department store in the middle of Victoria has been for most of its life known as the Army & Navy. It opened in 1872 and sold groceries, clothes, various apparel and originally guns. It used to be open only to members of the highest ranks of the armed forces and their widows. This changed after 1922 when it was open to all. It has gradually shrunk in size. Its warehousing and depot area was sold to the Post Office, its staff car parking on Artillery Row was sold in the 1980s to make offices and its old food hall closed and is now a mini shopping concession mall. In 2005 it changed its name to House of Fraser. The Roman Catholic Westminster Cathedral was built in 1903 filling a site previously occupied by the Tothill Fields Prison. Three notable schools are closest to the Victoria neighbourhood, Westminster City School for Boys and Grey Coat Hospital for Girls, as well as the independent Westminster School at Deans Yard near Westminster Abbey. Victoria is a designated 'Opportunity Area' in the Mayor's London Plan and 'Westminster City Council's Adopted Core Strategy January 2011' policy planning document, recognizing the potential of the area, with its excellent transport links to accommodate commercial and residential growth. There are a number of emerging proposals for major redevelopment in the area, including improvements to the Victoria Underground Station, and regeneration of surrounding sites. ^ "The history of London Victoria station". Network Rail. Retrieved 24 January 2019. ^ "The history of London Victoria station – Network Rail". www.networkrail.co.uk.